Ejscript Models are responsible for managing access to application data and for ensuring the data remains valid and consistent. Ejscript Models map database tables to classes, rows to objects, and columns to object properties. The foundation for Models is the Record class. Record instances represent database records. New models are created by implementing the Record class. This creates a new Product model for accessing the Products table. Note: we did not have to specify the table, column or primary key names names. Ejscript follows the Convention over Configuration design paradigm where developers need only specify the unusual parts of their application. In this example, Ejscript will look for a database table named Products and will map that to the Product class. By convention, Ejscript assumes that database table names are plural and Record classes are singular. You can override this if you need to by calling the setTableName Record method. However, it is best to work with the Ejscript conventions and defaults — life is much easier this way. Ejscript dynamically determines the column names in the database table and creates object properties at run-time corresponding to each column. You do not need to create or specify the columns in your Record class. Ejscript will determine the appropriate column type for you. Assume we have a database with a Products table that has columns for id, name, description and price. Ejscript assumes that database tables will have a primary key column named id. If you need the primary key column to be some other name, use the setKeyName method. Database connections are one of the few items that are setup by configuration files. The application configuration file: "config/database.ecf" defines the database name, username, password and other configuration parameters. This is an excerpt from the debug database configuration. Currently, Ejscript only supports the SQLite database. The database option is set to the filename of the database. Setting trace to true will trace all SQL statements that are executed against the database to the application log. The Ejscript mvc command can be used to generate models and database migrations. When generating a model, mvc will create a database model class and a database migration script. If field:type pairs are supplied, the database migration will include code to create a column for each specified field of the requested type. The valid database types are: binary, boolean, date, datetime, decimal, float, integer, number, string, text, time, timestamp. Once the model is generated, you can add methods to implement logic to manage updates and validate model data. Models typically provide a suite of methods for controllers and views to access. It should be easy to do simple things like implementing the basic database operations: create, read, update and delete. Ejscripts Models make this easy. product.description = "Bright red race car"
That will create a new product, initialize its properties, and save it to the database. Reading a record from the database is done with the find family of Record static methods. The basic find method will return a record with a given id field. Other find methods include: findAll, findWhere and findOneWhere. These provide powerful query capabilities and are able to do conditional queries and table joins. To update a record, first read it using one of the find methods. Then update any of the object properties. Finally, call the save method to save the changes to the database. Records have a static method remove which will remove the record with the given primary key id. This will find up to two products, and will sort the result grid by descending price. Other options include: group, limit, offset and joins. Ejscript Controllers and Views are the primary users of model data. Controllers will typically interact to create, read, update, and delete model data. Views will typically (or should) use read-only access. Ejscript models can also be bound to View Controls for easy display. Many of the View Controls can take a model instance as a parameter with options to select the properties to display. The table View Control method is a good example. It can bind to a model and, via a one-line statement, display the table. It has options to sort, filter, and select columns and dynamically refresh the table contents as the underlying database data changes. This will display a View containing a table of the products. Controller facilitated access is perhaps the most powerful access methodology whereby the controller creates a suite of methods to manage and control access to the model. These methods can then validate and enforce consistency checks on the data. Ejscript provides a validation mechanism that is invoked prior to saving a model to the database. It also provides a set of pre-defined validation methods that you can use in your model. These cover the most common validation needs such as ensuring a field is unique or numeric, or conforms to a specific format. When a validation check fails, an error message is added to the model for the field that failed validation. Validation checks continue and (potentially) a set of error messages for the model are accumulated. Views can access these messages for display and highlighting to the user. 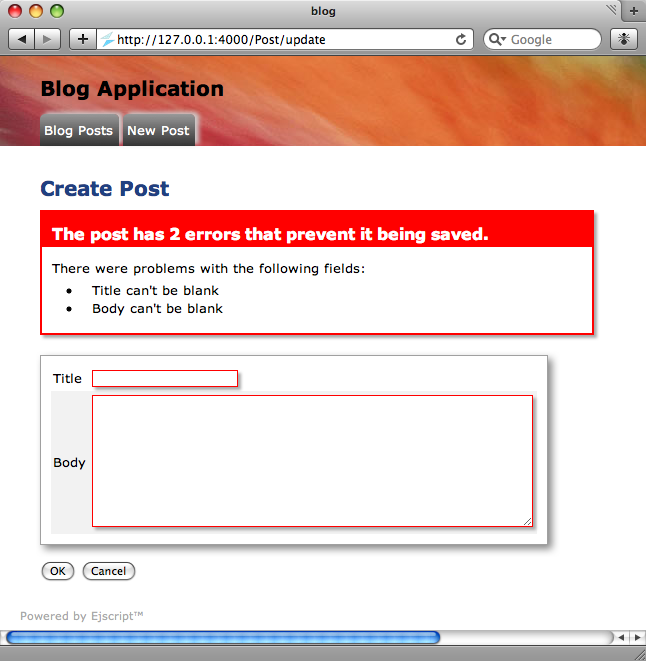 The standard Ejscript view controls intelligently use these error messages to highlight errors in input forms. Ejscript will also automatically verify and convert model data to ensure it is of the appropriate data type and will escape data to prevent SQL insertion exploits. The following validation methods are available for use inside a model. Define these in the class initialization section of your class so they run when the class is first created. The validation methods take either a field name or array of field names as the first parameter. The second parameter is an options hash which can contain a message option to override the standard validation failure message. This validates that the field is defined with a non-empty value. This validates that the field is a number and only contains numeric digits. This validates that the field's value is unique in the database. This validates that the field's value conforms to the regular expression format supplied via the format option. In addition to the standard validation methods, a model can do custom validation by defining a validation method. This will be called along with the standard validation methods before saving database data or when the validateModel method is called. A validation method should call the error method for each invalid field and supply a suitable message. To set an error that is not associated with any specific field, supply the empty string as the field argument.